It was a family finish in today’s Alf Beashel Memorial Trophy 18ft Skiff race on Sydney Harbour when John Winning Jr. skippered Gotta Love It 7 to a 35 seconds victory over Yandoo, skippered by his father John Winning. Lumix finished third, a further 31seconds behind Yandoo, followed home by Asko Appliances, Coopers 62-Rag & Famish Hotel (Euan McNicol), Thurlow Fisher Lawyers (Micah Lane) and Noakes Youth (Ash Rooklyn). 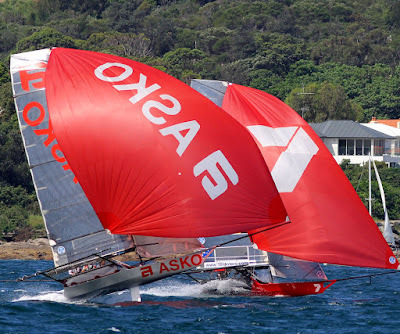 The Lumix team of Brett Van Munster, Aron Everett and Greg Dixon clearly won the start at the pin end of the line and sailed beautifully up the first to hold the lead at the Beahel Buoy windward mark. Gotta Love It 7’s John Winning Jr., Scott Babbage and Nick Catley were in a three way battle with Asko Appliances (Marcus Ashley-Jones, Fang Warren and Harry Bethwaite) and Yandoo (John Winning, Jim Beck and Cameron McDonald) for second place. 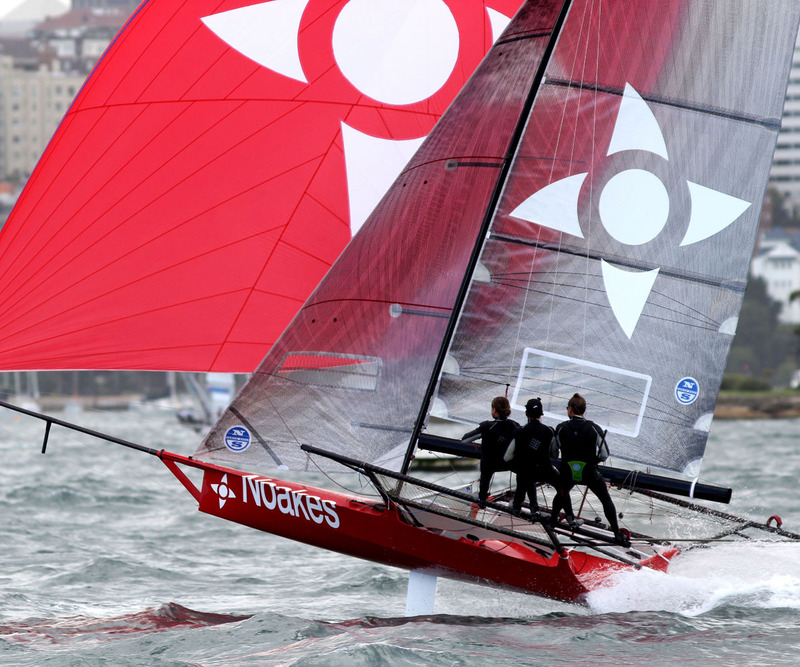 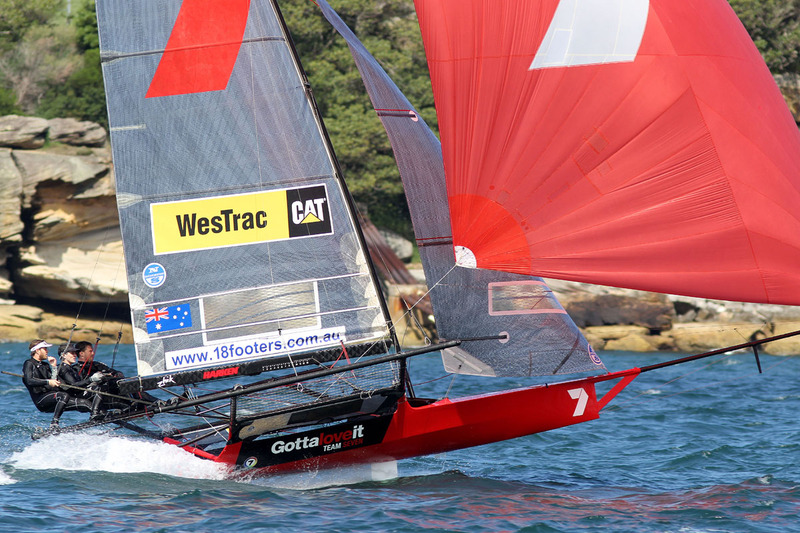 The skiffs were ‘jumping’ down the first spinnaker run to Shark Island with the leading positions unchanged from the mark rounding. An early casualty was the brand new Smeg, which was launched for the first time only minutes before the start. The crew were concerned that a problem with the mast was too risky to continue in the 18 knot North East wind. 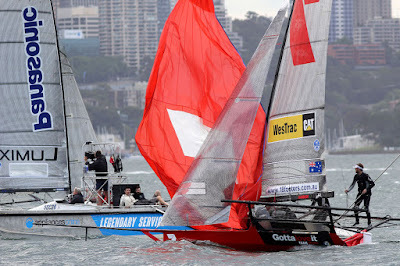 Gotta Love It 7 began to pressure Lumix on the second windward leg but Van Munster and his team were up for the challenge and maintained a 20s advantage over Gotta Love It 7 at the Beashel Buoy. 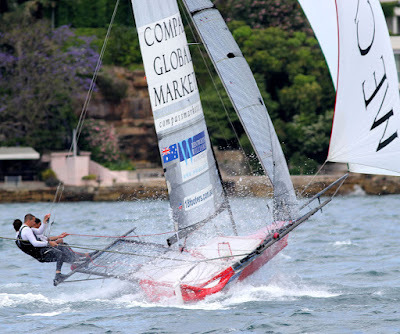 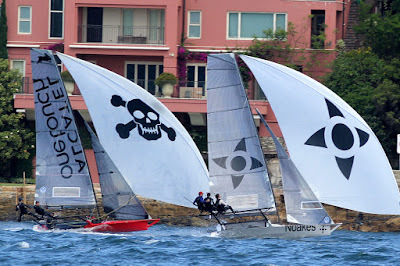 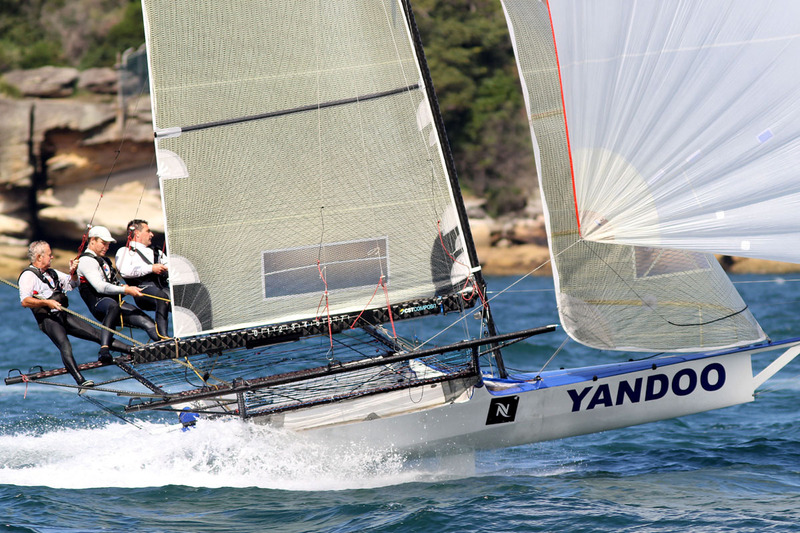 Coopers 62-Rag & Famish Hotel had sailed extremely well on that leg and shared third place with Asko Appliances, just ahead of Yandoo as spinnakers were set for the run down the centre of the harbour. 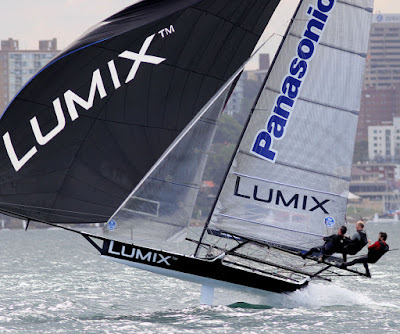 Again, Lumix was able to maintain the lead and had actually increased the margin by 5 seconds at the bottom mark. 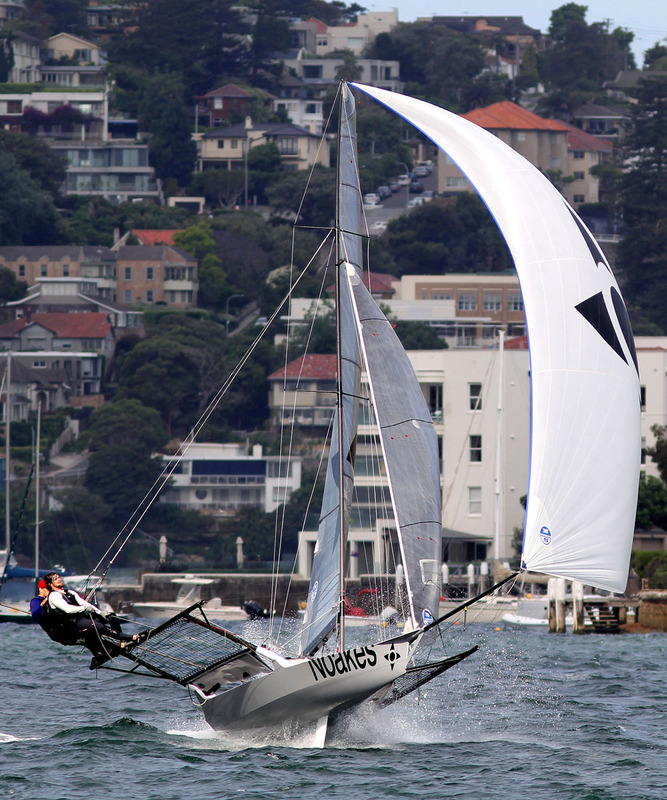 With positions changing regularly behind the first two teams, it was one of the closer North Easter races in several seasons. 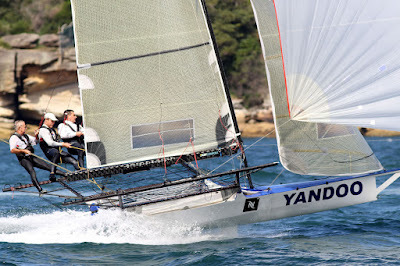 Yandoo was in third place at Clarke Island, ahead of Asko Appliances and Coopers 62-Rag & Famish Hotel. The conditions took a toll on several teams with De’Longhi (Simon Nearn), Mojo Wine (James Ward), Pure Blonde (Nick Daly) and Alcatel One Touch (Stephen Quigley) forced to retire.